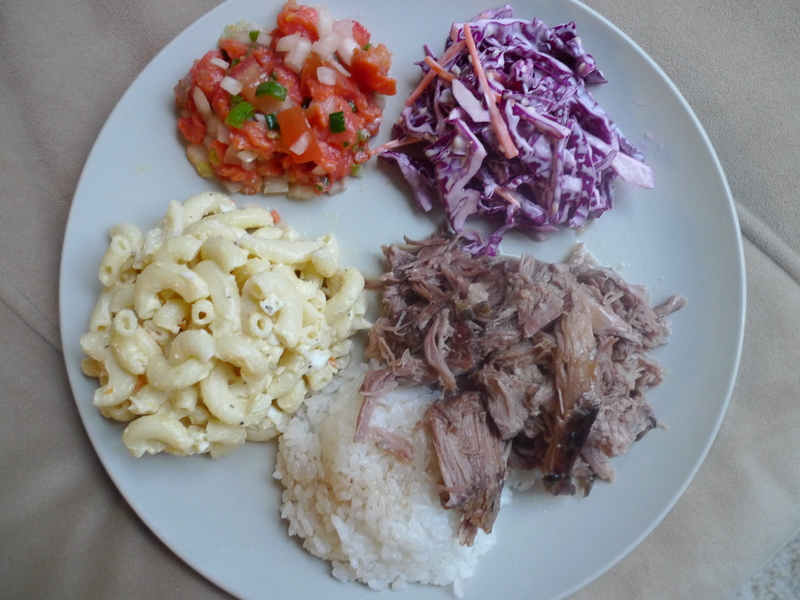 As Natalya mentioned in our last post, our buddy (and now neighbor) James was cooking up a stellar Kālua Pork dinner and we decided to make some sides to complement the Hawaiian BBQ theme. James also made Mac Salad, Natalya made Cole Slaw, and I decided to make lomi-lomi salmon. I initially discovered the refreshing, raw flavors of Lomi Lomi Salmon from a luau I had attended during a family vacation to Maui. Lomi means “to rub, squeeze, massage” in Hawaiian; it refers to dish’s preparation which requires massaging the salted fish with diced tomatoes and sweet Maui onions. The term “lomi-lomi” became ingrained in my mind after watching the movie Meet the Fockers… there is a scene where Barbara Streisand is giving Robert De Niro a “lomi lomi massage” which prompts Ben Stiller exclaims: “Mom, you were riding him like Seabiscuit!” Man, that was a great film. Anywho, back to the dish. 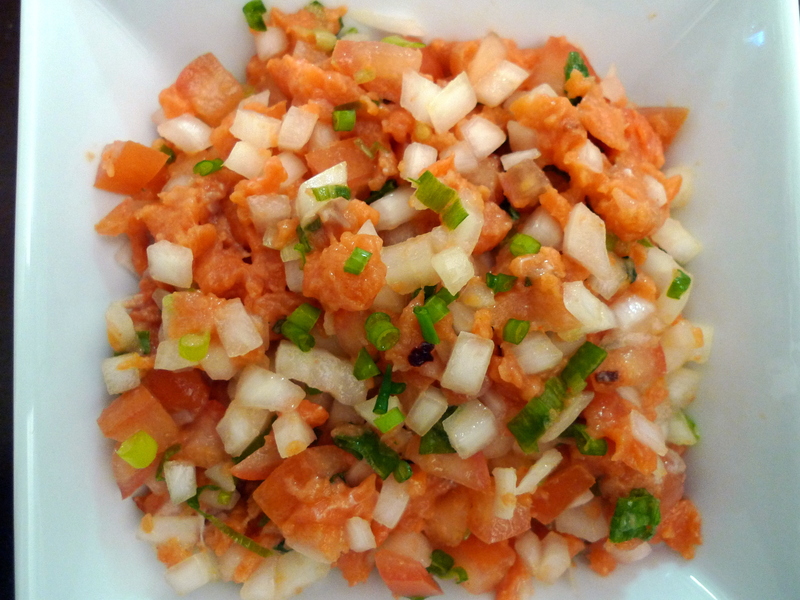 Lomi-lomi salmon was first introduced to Hawaiians by early western sailors. 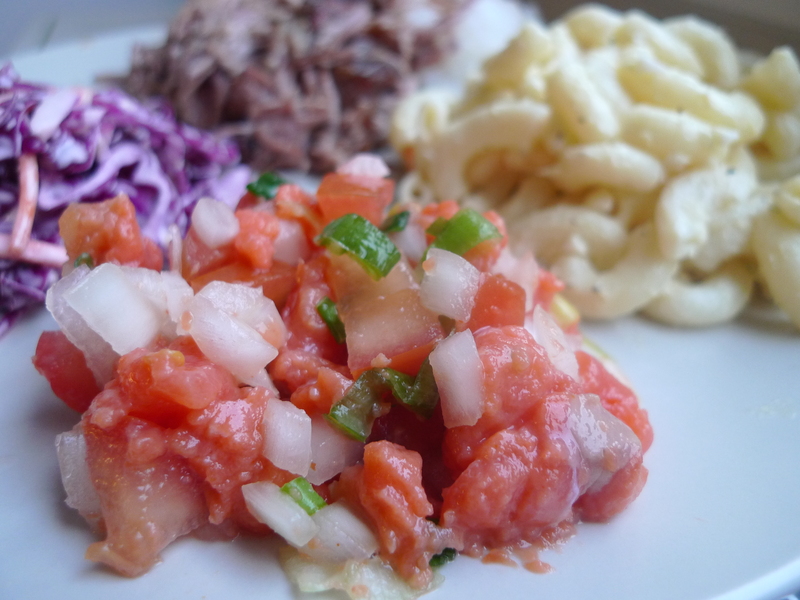 For a legitimate, traditional Lomi-Lomi Salmon recipe, check out Captain Mike’s recipe. If you don’t have easy access to sashimi-grade salmon or have two days to cure it, try the easier “cheat” version I did below. I spent days checking out the local fish markets and scouring specialty grocery stores for fresh salmon that would be safe to eat raw, but I just didn’t feel comfortable enough with what I found. And thus, I ended up just buying gravlax, which is a Nordic dish that cures salmon with salt, sugar, and dill. Obviously this is not a traditional lomi-lomi salmon as I also couldn’t find any sweet Maui onions in the city… but I think this urban version was just fine for our Hawaiian BBQ dinner. In a medium bowl, mix together the salted salmon, tomatoes, white onion, sea salt and cayenne pepper, using your hands to break up the salmon chunks. Add the green onions and let chill for at least 30 minutes before serving. Lomi-lomi salmon is best served really cold, and often people will add crushed ice to chill the dish before serving.